Tom Pidcock, right, came down very heavy after riding a great race. Darragh O’Mahony, far left, was left with nowhere to go and his chance of a placing was gone. 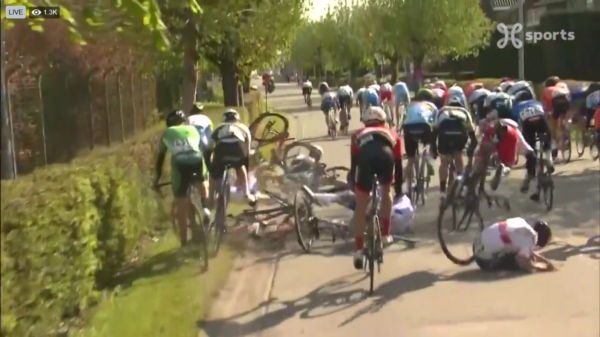 A crash as the final sprint was just starting in the U23 Tour of Flanders yesterday took about one third of the lead group out of contention. The incident occurred close to the front on the left side of the group, with a number of riders crashing hard at speed. Team GB’s rising star Tom Pidcock was left on the road for some time afterwards, clearly having come down hardest of the fallers. He had ridden very strongly during the race, having forced the pace on several of the hardest sections. Ireland’s Darragh O’Mahony was in the front group and, as the clip below shows, his chance of a placing was gone the moment the crash happened. He was caught behind it, with nothing to do but pull his brakes while the rest of the group continued to sprint for the finish line a few hundred metres away. Thankfully Darragh O’Mahony was not injured and he finished just 10 seconds behind those who fought it out on the line for victory. You can read our report on the race, including the breakaway of Irish rider Dillon Corkery, by following this link.